A few weeks ago I posted three of the four Aussie Indiana Jones variant figures, and now thanks to regular contributor and Toltoys afficianado Brody Walker, here is the last of the quartet; the Cairo Swordsman. 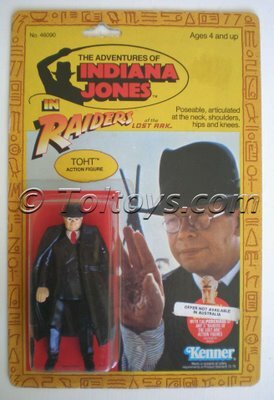 Here we go with another four of the Indy Kenner line of figures from 1981’s Raiders of the Lost Ark. 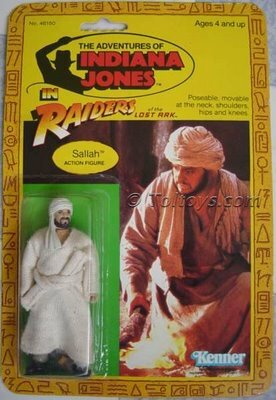 First up is Indy’s digging buddy Sallah, played on screen by Middle Earth’s tallest Dwarf, John Rhys-Davies. 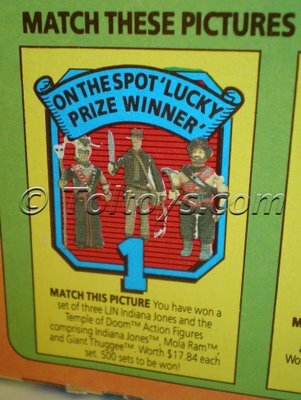 This is the hardest to find of the the figures shown here, and tough to get with a nice clear bubble. Next we have the German Mechanic as played by Pat Roach. Roach actually played a series of villains in the first three Indy movies. The tiny wrench accessory from this figures is easily lost. 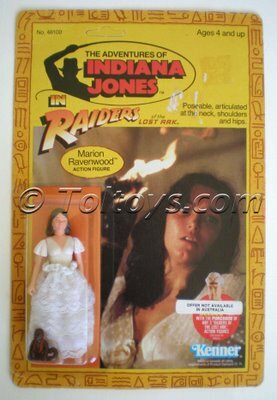 French archeologist Rene Belloq is up next, the little paper map accessory that came with this figure is often missing from loose figures. Indy trivia lore states that actor Paul Freeman did in fact swallow the fly that crawled into his mouth during the scene where Indy threatens to blow up the Ark. 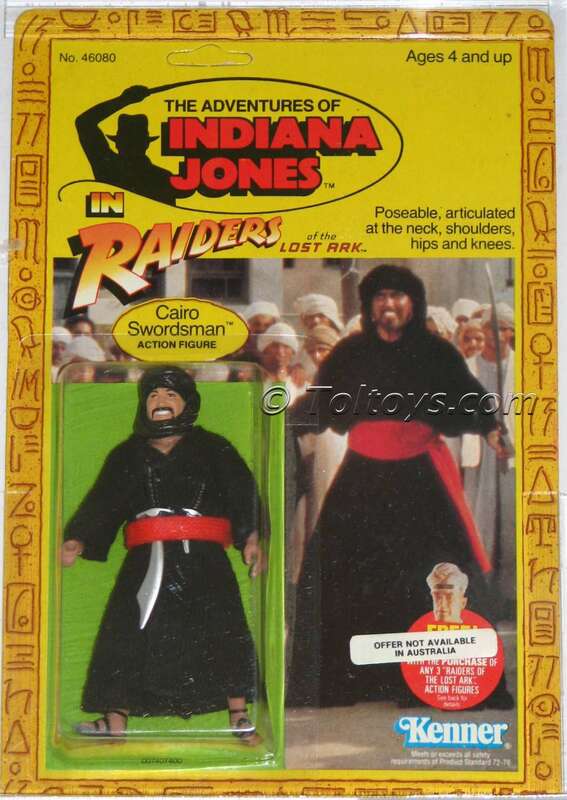 Lastly today is the Cairo Swordsman, along with the Toht figure the most common in the Indy Kenner line. # 1 Indy’s bullwhip is made of Kangaroo hide. 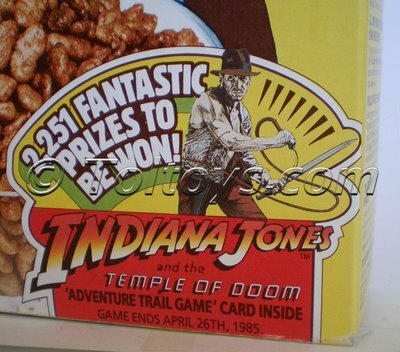 #2 Indy’s hat was listed as an “Australian model” when purchased new in London by the costume department. #3 The mountaineers challenging Marion to the drinking competition in her Nepalese bar are supposed to be Aussies. 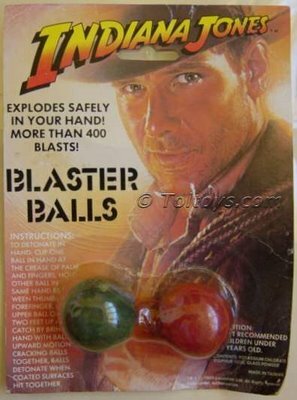 Keen on more Indy toy info? 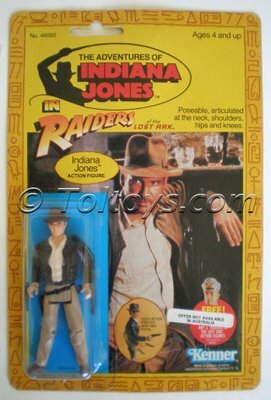 Check out Raiders of the Lost Toys. 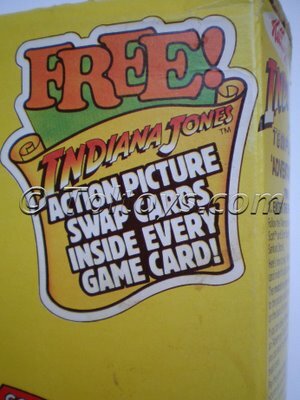 Nothing screams “Buy Me!” more than a sticker telling you about a fabulous free toy you can’t get. 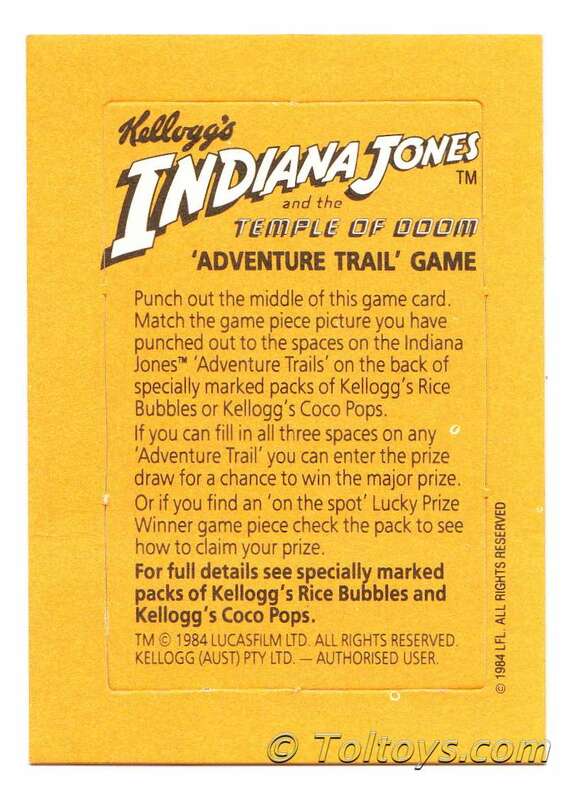 While those lucky little sods stateside were sending off three POPs (Proof of Purchase) by the truck-load for their “Free Belloq”, little Aussie kids were only allowed to dream about ever owning the famed French archeologist the German’s called Bellosh. 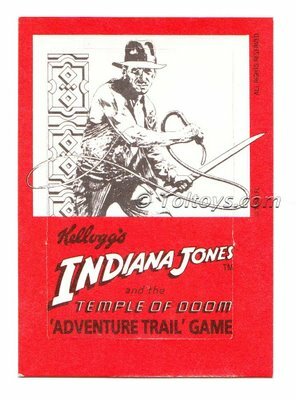 Kenner’s Indy line was famous for completely stuffing up the case ratios in the release of the first four figures, heaps of Tohts and Cairo Swordsmen and bugger-all Indys and Marions. 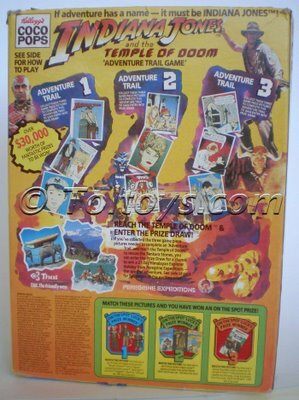 I have a mate who recalls standing in Adelaide’s largest toy store searching through an entire wall of Tohts and Swordsman for either of the other toy and coming up empty. 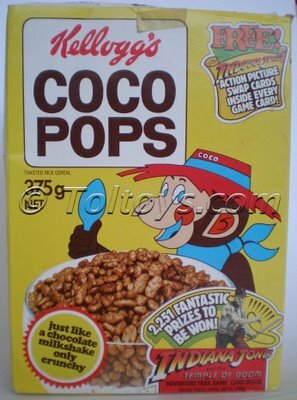 The figures were not re-ordered by the retailers in the quantities hoped, and the line died a slow death after a second release of five new characters. 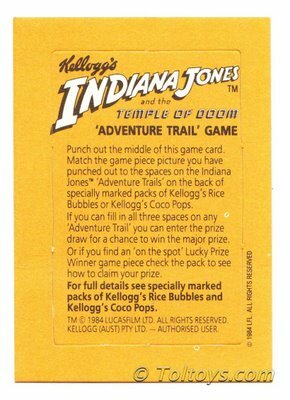 The sluggish sales were likely the reason Toltoys opted out of printing their own cards, so we received the US versions with a corrective sticker attached telling us not to send of POPs to the US, although I wonder how many Aussie kids did? Tears before bedtime if they did! 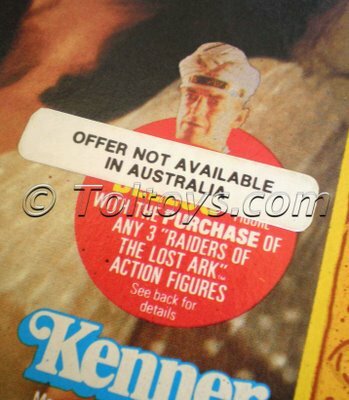 So here we are all these years later and Indy is back on the big screen, and the first four Kenner Indy figures with the Australian sticker attached are now among of the rarest and most sought-after variations in the Indy collecting world.